The Baldwin-Spencer Cottages, previously the Baldwin Cottages and Spencer Cottages, were located west of the Rowdon Cottages. The three cottages owned by James Lavender, were built circa 1938 behind the house that fronts The Strip. They are the Cape Cod, Blue Moon and Beach View, although the signs have been removed. These cottages were owned by Heber Spencer. Heber and Clara Bennett Spencer owned the Youngstown Manor cottages on the south side of Lake Road, across from Heber’s lakefront property. Heber and Clara divorced in 1939; Clara received Youngstown Manor and Heber retained the lakefront property on which he built the cottages. A February 1929 survey map shows that the three lots had 49 feet of frontage each and extended from the street to the beach. The lot west of Rowdon was owned by Ella Spencer and Marguerite Ormsby (later Baldwin). The next lot was owned by Heber C. Spencer and Bert Taylor. Spencer and Baldwin married after Heber’s divorce from Clara in 1939. Thus the three Baldwin cottages and three Spencer cottages were combined into a six-cottage operation. 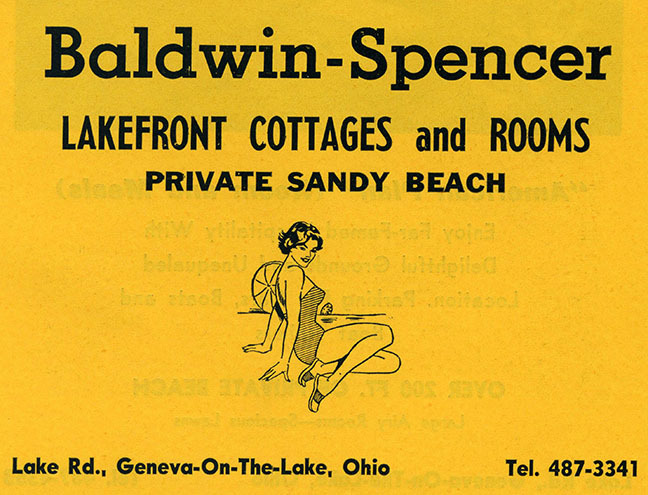 The operation was owned by school-teacher partners, then broken up when the row of eastern-most cottages was sold to James Lavender and the former Baldwin Cottages sold to Bill Porter.